In a previous post (with programme links) I mentioned that the XXV International Congress of Papyrology is on from July 29 - August 4 2007 at the University of Michigan. I am not sure whether any of our regular readers or contributors are attending, but Gregg Schwendner is virtually blogging this conference (he is not actually there, but is providing all the paper titles and abstracts in chronological order) over at What's New in Papyrology? Some of these are of interest to NT textual criticism so I shall take the opportunity of posting them here. The first one of interest is Theodore S. de Bruyn, "Christian Amulets with Biblical Inscriptions: a Catalogue in Progress"
This paper will report on an aspect of a project to prepare a catalogue of edited Greek formularies and amulets (papyri, ostraca, lamellae, tabulae) containing Christian motifs and dating from the second to the eighth centuries CE. The catalogue is preliminary to a study of the incorporation of Christian liturgical sequences into Greek formularies and amulets. Scholars have differed in their criteria for identifying Greek formularies and amulets containing Christian motifs. Van Haelst’s catalogue of Jewish and Christian papyri included amulets consisting of prayers, acclamations, or citations from the Bible or the Christian liturgy (Catalogue des papyrus littéraires juifs et chrétiens, 1976, 414), whereas these were excluded from the more recent compilations of Brashear (ANRW II.18.5, 1995, 3492-3; cf. 3480 n.486) and Daniel and Maltomini (Supplementum Magicum I, 1991, ix). Both approaches have their merits. While the latter focuses on unique or specific features of magical texts, the former is more inclusive of the entire range of materials with Christian motifs that were used as amulets. This paper will (1) review criteria used to identify papyri inscribed with one or more biblical passages as amulets (e.g., evidence that the papyrus was folded or tied, evidence that the papyrus did not form part of a larger roll or codex, etc. ); (2) present an up-to-date list of edited papyri inscribed with biblical passages and deemed to be amulets by their editors or commentators; and (3) discuss doubtful or problematic cases. The SBL International Meeting in Vienna is just over. However, I am sitting in a computer room and writing these few lines. Next to me sits Richard Hess from Denver Seminary answering his mails. Richard was presiding in the session "Working with Biblical Manuscripts" in which I and co-blogger Martin Heide presented our papers. However, the first presenter in our session was Dr. William Warren from New Orleans Baptist Theological Seminary who made a wonderful powerpoint presentation about the Center for New Testament Textual Studies. The center has recovered fine from Katrina, and is expanding in several areas. They will relocate to a new building in the next three years where there will also be a new Bible Museum (the only of its kind in northern US, the other one is in a theme park in Orlando). The center has received new donations and will expand their collection of microfilms, which they also plan to digitize and make accessible provided that the copyright holders agree. Warren presentation also included a despription of the several areas of text-critical research that is done at the center presently. I delivered the second paper presenting a some items from the collection of Greek manuscripts in the National Library in Vienna. The first item, MS. Historicus graecus 88, I argued should be included in the official list of Greek New Testament manuscripts (Kurzgefasste Liste). Moreover, I discussed a few more items that do not qualify for inclusion in the list, such as a commentary manuscript with full biblical citation only up to Matthew 5, and then abbreviated text cited. I think we would all agree that where the text is fully cited, this MS is as good for TC purposes as another commentary MS with complete citation throughout a book like Matthew (only the latter can be included in the Liste). I also discussed two palimpsests from Gospel lectionaries (one uncial lectionary from the 10th century). Have they escaped notice, or has their fragmentary character prevented them from being registered? I suggest that all fragments whether early or late, containing NT text should be registered (not just papyri or parchment, or other when attesting to remarkable variants). "Dr. Martin Heide spoke on 'The Stability of the Transmitted Texts ofthe New Testament and of the Pastor Hermae.' He showed how ananalysis of portions of the early papyri in comparison with the N-Atext and the Byz text forms in the NT reveals that the copyingoverall was quite good, with an average divergence per ms from thesetwo text forms of about 96.3% versus the N-A text and 92.6% for theByz text form. In comparison with this, the early Pastor of Hermasmss reveal more divergence, thereby implying a less strict copyprocess. The implication was that the NT mss showed a better copyprocess in their transmission than those of the Pastor of Hermasones, so some assumptions about how NT mss were copied may need to berestudied or re-thought. Adam Anderson presented research from a joint study by himself andPaul Hoskisson on the topic of "To Mar or to Anoint: A New Look atIsaiah 52:14." A dual reading of "anoint" and "mar" (readingsattested textually in the witnesses) was proposed in connection withthe surrounding verses, with alternative readings in those versesbeing linked to the two meanings in 52:14. Jae Hyung Cho's presentation was on the variant readings in 1 Cor.15:51. He argued for the reading attested by P46 versus the currentN-A/UBS text. In the evening, the Austrian National Library opened their papyricollection's special display to attendees. We had a wonderful timelooking at one of the best papyri collections in the world, includinga page from P45 and several other OT and NT mss." 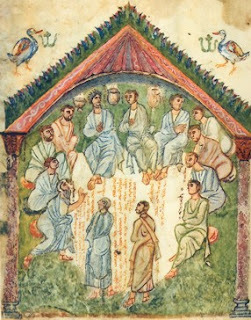 As an additional comment to Cho's paper I can add that he also sought support for his reading in Codex Alexandrinus, but had misunderstood the attestation in that manuscript, which I could gather from the enclosed facsimile page. In fact, the NA presentation for Codex A in that passage is rather misleading (comments invited). I pointed out to Cho that there are two corrections in the text (text starting on the left column on the facs page, line 23), one is supralinear (adding a OU), one is on the line (where the corrector changed an original OI to OU by adding two strokes on the I turning it to an upsilon). I agree with Bill Warren that we had a wonderful evening at the National Library and their Papyrus Sammlung. Many thanks to the director Cornelia Römer who guided us, and invited scholarly discussion around the items on display (24 items including their fragment of P45, P116, and other treasures). Römer also made a wonderful presentation of a paper in the Early Christian Art and Archaeology section in the SBL Meeting. Unfortunately, she was prevented to present in our session. I have just arrived in Vienna for the SBL International Meeting. On this, the first day, there was the opening session by Kent H. Richards of the SBL and then James Alfred Loader of the University of Vienna held a lecture entitled When Poverty Undermines Thinking: An Aspect of Biblical Reflection. The first 20 minutes were a bit boring, then it got better and better. However, I still look forward to the sessions later this week including those in Working With Biblical Manuscripts, in which I am presenting myself. Perhaps I will have time to do some blogging. Anyway, I got to meet co-blogger Martin Heide today, which was very nice. Martin will present his first paper tomorrow morning. He has been working with some Hebrew ostraca from the collection of Shlomo Moussaieff, who is in fact here in person. I will attend that session which include speakers as André Lemaire, W.G. Lambert, Richard Hess and Meir Lubetski. For news from IOSOT on James Charlesworth's announcement of a new fragment of Genesis 32.3-7 see Chris Brady and here (which has an image). Obtained by P.J. Williams for Tyndale House from Prof. A.R. Millard (Liverpool), who obtained it from Prof. F.F. Bruce. The originals are to be lodged in Tyndale House library for consultation. R.H. Connolly to F.C. Burkitt: Burkitt’s article on Hosanna in JTS 17 (1916) pp. 139 ff. has led Connolly to a number of observations from ‘a long and wearisome commentary on the Nestorian Offices’. 4 sides. Written from the Red Cross Hospital in Giza by E.C. Hoskyns. Addressee unnamed but appears to be singular (from p. 2, but is not Burkitt). Type-written. Five sheets of paper, single sided. The writer is evidently acting as a chaplain in a war hospital. On the first side he discusses the merits of having communion at 7.15 a.m. or 9.30 a.m., preferring the former. On Christmas day he plans to have one at 6.30 a.m. and another at 9.30 a.m. The Bishop has arrived today (p. 2). Discusses a ‘Doctor friend’ who is now attending communion. ‘He is a simply splendid heretic & has taught me a great deal about the O.T. especially about Leviticus…’ (p. 2). ‘When you say the Coptic church failed because it was not missionary, I do not believe that it is so at least as most people understand “missionary”. The Coptic & the Syriac churches lasted on for a very long time but they failed to hold the people because they failed to produce men of really independent & free minds’ (p. 2). P. 3 contains the phrase ‘as Burkitt says’. It also discusses whether clergy should enlist. P. 4: ‘My little Frenchman who teaches Coptic, is a brilliant little scholar.’ P. 4: discusses tribe of Bedouin known as Senussi and their beliefs. 4 pages, headed on Trinity College, Cambridge, notepaper. From ‘A A Bevan’. Begins: ‘My dear Burkitt, I am extremely glad to hear that you are interesting yourself in Mitchell’s Ephraim [i.e. S. Ephraim’s Prose Refutations of Mani, Marcion, and Bardaisan]. The situation is briefly as follows. When his death was announced, I told Whitney and Barnett that I was willing to be responsible for correcting the proofs of the remainder of this text and seeing the translation through the press.’ It discusses the state of work done and what remains to be done. It also discusses Bevan’s attempts to read the manuscript (presumably BM Add. 14623). ‘But my chief difficulty is that my attempts to read the original MS by means of a re-agent have been almost wholly fruitless’ (p. 3). Bevan expresses a willingness to hand Mitchell’s papers over to Burkitt since the latter is ‘better able to deal with such things…But I do not want to send manuscripts to France, on account of the risk of their being lost’ (p. 4). 4 pages, headed on Trinity College, Cambridge, notepaper. From AAB [A.A. Bevan] to Burkitt. ‘My dear Burkitt, Many thanks for sending me your Introduction. Here are some notes on it.’ Burkitt has given the date 238 for when Mani proclaimed his religion. Bevan notes that Nöldeke uses the date ‘March 20, 242’. Pp. 2–4 discuss various corrections to Burkitt’s work, including discussion of Syriac, Arabic and ‘Mandaitic’ words. Two sides of notes by F.C.B. (i.e. F.C. Burkitt) which appear to be peer reviewing a Hulsean Essay on Marcion. It begins ‘It is a little difficult for me to give a judicial opinion on this Essay because I do consider myself aggrieved.’ He criticizes various bibliographical omissions of the author and weaknesses in the argument. I am unsure as to the identity of the essayist, but given the review it is quite possible that it was never published. Two press cuttings from ‘Durrant’s Press Cuttings’. 19 July 1928, review in the Literary Supplement of The Times of F.S. Marsh, The book of the Holy Hierotheos. The Quiz element is simple: describe what is going on in each of the circles (1 is top left, 10 is bottom right). I have been reading Hurtado's book The Earliest Christian Artifacts (despite not being an 'ideal' reader as envisaged by the 'implied' author). If I have enough time/energy/desire/will-power I shall attempt some discussion of it based on the question marks I have written in the margin. Perhaps unsurprisingly, the first issue is based on a point of detail. Granted that LH probably hasn't investigated this by autopsy, I assume he may have copied the term that was used by the editor of the piece. So does this list accurately distinguish between vellum and parchment? If it is possible does the distinction have any implications in terms of costs, location, etc.? Has anybody ever attempted something so thoroughly artefactual as this? Parchment is made from the split skin of the sheep. The grain, or wool, side of the skin is made into skiver, a strong leather; the flesh, or lining, side of the skin is converted into parchment, provided the skin is suited to this exacting purpose. If not, the lining side is usually made into the less expensive chamois or suede. Vellum is usually calfskin prepared by a lengthy exposure in lime, scraped with a rounded knife and finally rubbed smooth with pumice stone. As a rule, vellum is made from the entire skin, not split as is parchment made from sheepskin. Vellum is also made from goat, lamb, and deerskin, and can usually be distinguished from parchment by the grain and hair marks producing a somewhat irregular surface. In many European manuscript books executed by monks upon parchment and vellum a difference between the hair side and the flesh side of the pages is noticeable, the latter being somewhat whiter in appearance. The difference is more pronounced in earlier books as later parchmenters used more chalk and pumice on the hair side than was the custom earlier. In order to make these differences less obvious to the reader, scribes would organize the sheets, prior to writing, so that one spread consisted of hair sides, and the next spread of flesh sides, alternating throughout the manuscript. Mikael Parsons, author of a many interesting and important books, one-time visiting fellow at Tyndale House, long-time follower of this blog and NT Prof at Baylor, requests some help: "I wonder if you would mind posting a request for bibliography discussing illuminated manuscripts that depict scenes in Acts (and I'd be grateful specifically for some bib on the Rabbula ms.)"
Here is the background: "Heidi and I are working (slowly) on the Blackwells commentary on Acts; at the moment we are looking into Acts in the history of Art. 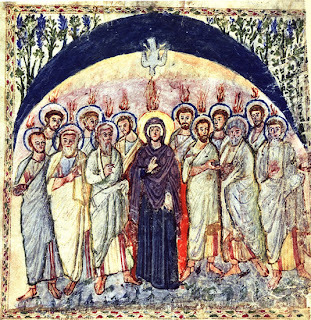 I think the earliest image of Pentecost is to be found in the Rabbula Gospels (here in Florence, where we are at the moment). and one of the few illustrations of the selection of Matthias." "Origen (C. Cels. 2.262) gave the name Simon to the anonymous companion of Cleopas in Luke 24—the first of many attempts to identify this disciple. [FN(18): If Origen intended, as he probably did, an otherwise known Simon, this would not really be an example of the tendency [of naming the previously unnamed, DJ] we are discussing. He may have identified Cleopas correctly with Jesus' uncle Clopas and Cleopas's companion with Clopas's son Simeon/Simon, known from Hegesippus as the second bishop of Jerusalem.]" There is a little bit more to say about this issue as there is some textual variation involved. 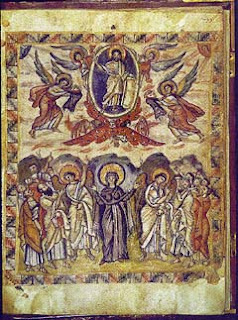 In Luke 24:34 Bezae reads λεγοντες instead of λεγοντας, turning the two man who had just returned from Emmaus into the ones saying 'the Lord ... has appeared to Simon.' The idea here is that it is not the Eleven saying to the Two that Jesus appeared to Simon, but the Two to the Eleven, indirectly identifying the companion of Cleopas. Admittedly, Bezae is later than Origen, but Amphoux pointed out (correctly in my opinion) that it is this Western reading that lies behind the long ending of Mark: 'he appeared in another form to two of them, as they were walking into the country. And they went back and told the rest, but they did not believe them.' This fits perfectly with the scenario of the Bezan Luke 24: The Two return to Jerusalem, they tell the Eleven that Jesus appeared to them. However, the Eleven do not believe the Two and then Jesus himself steps in and rebukes the Eleven. If this is correct than Origen was not the first to identify Cleopas's companion with a Simon. 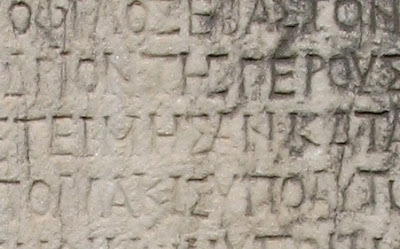 The tradition must have been around somewhere in the second century, at the time when Mark received its long ending, and survived in the Lucan text of Bezae. Though I cannot prove that the influence does not go the other way (that is, that Bezae tries to smooth out the historical problem created by the Long Ending), it seems less likely: the solution is limited to a single manuscript and not picked up by any other scribes who were faced with the apparent inconsistency between the Long Ending and Luke 24. It is Summer so it is time for those posts that are even more tangential to TC than the usual ones. 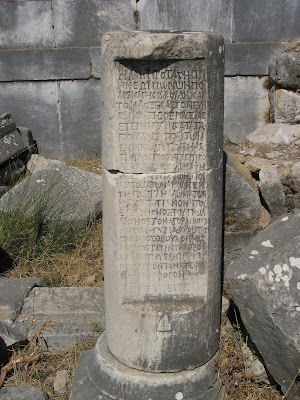 Whilst on a field trip in Turkey, I noticed the following inscription in Priene (I.Priene 246), dated to the 3rd century AD on the basis of the script. What struck me are the many ligatures where the vertical strokes of the letters are combined, not unlike the ligatures in some of the later 4th century codices. This example shows the combination of Η Ν Π in την πολιν, the one below shows a combination of Η Σ in the second line, but compare the line below where the two letters are written separately. I do not intend to make a study of the development of such ligatures and of the localities where and the times when, but I could see some potential in such a project (unless this has been done already, of course). Marie-Luise Lakmann, 'Papyrus Bodmer XIV-XV (P75): Neue Fragmente' Museum Helveticum 64 (2007) 22-41. This covers new material from Lk 4:1-2; 5:37-39; Jn 6:10-12, 24-27; 11:15-18, 31-33; 12:47 - 13:10; 14:9-10; 14:26 - 15:10; that has been rather inconsistently appealed to in different text-critical sources (NA27 often cites P75 in these places; but the IGNT John book does not offer any of them). I haven't seen this article yet. Whoever sees it first might like to post some more details. "Parchment paper, one of the first versions of modern paper, is now going to be produced again on a large scale to promote the tourism industry in Bergama. Originally invented in this district of present-day İzmir 2,000 years ago, parchment paper made Bergama (then Pergamon) an "advanced civilization of the ancient world" and "the capital of art and thought." Now the Bergama Culture and Arts Foundation (BERKSAV) has taken on the task of giving new life to parchment." Typically when you visit a manuscript collection, there are microscopes and other tools available to assist with viewing artifacts. I have found it helpful to bring my own microscope on several occasions. Often the provided microscopes are so large that it requires the user to relocate to a position where the tool is bolted in, and there is also the added element of exposing the manuscript to light in order to make the microscope work effectively which may set your curator on edge. Portable magnifying glasses are often of the 2x/5x variety which I find to be too weak to really examine ligatures and ink blots (e.g., these). About a year and a half ago, I did some web research and found that there is a niche market for geological field microscopes which suit paleographic purposes well. There are more powerful microscopes which offer very high resolutions and digitally feed to your computer, but they are very expensive (e.g., here, here, and here). I like my 10x/20x pocket piece which I got here. There are a couple items out from Bausch & Lomb which look like they would be very nice. Their eyeglass loupes are low power (3x–7x), but offer hands-free magnification. The company also has a folding three-lens magnifier which is reasonably priced and offers what I think is about the right range of magnification for someone doing paleography. Microscopes.com offers a wide selection of all sorts of tools if you want to look for yourself.